Swing into action with your friendly neighborhood Spider-Man and this Ultimate Spider-Man CityScape Wallpaper Mural by RoomMates Decor! Featuring officially licensed art that will have all fans raging, this Ultimate Spider-Man Wallpaper Mural is a must-have for Spider-Man lovers of all ages. 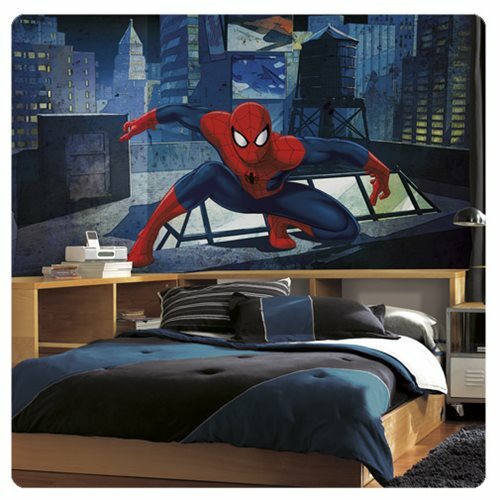 Captivating one of Spider-Man's many adventurous moments swinging away amongst a high crime New York City scene, add this look to any wall in no time with the fast installation process. To install, simply activate the high quality adhesive on the back of each of the seven panels with warm water and apply them directly to the surface. That's it! Measures 10 1/2-feet wide x 6-feet tall when fully assembled.